When Upper Deck Black made its first appearance in basketball products three years ago, collectors were floored. The cards looked like something straight out of a Johnny Cash concert: the design was unlike anything released up to that point, and the format of the product was unprecedented. Through each 2006/07 Upper Deck NBA hobby box, redemptions were inserted for collectors to claim their one-card pack of the product. Each card featured either memorabilia or an auto, some with a few of the craziest patches I have ever seen. The product was wildly successful and collected, leading to another incarnation of Black the following year (as a stand alone product). Collectors embraced the new format and the packed content, thus growing the set’s reputation to something of a cult status up until this year. 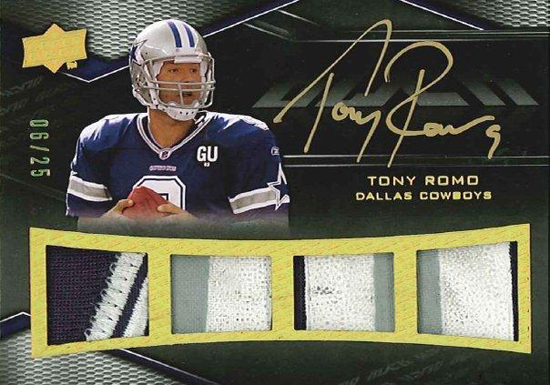 Luckily for football collectors, Upper Deck Black is expanding this year for the first time to the NFL. It features the same configuration as the popular basketball product, and I could not be more excited to see what is in store. When black was previously released, there were always surprises; whether it was a huge amount of Michael Jordan autos, crazy eight player autograph cards, or even a plethora of 1-of-1 parallels to the already amazing cards. Black did not ever fall short. This meant when you opened up a box, most of the time, you were going to get something worth telling your friends about. Black Football looks to be in the same vein, with on-card autographs, acetate auto memorabilia cards, multi-signed rookie cards, and new filmstrip autographs that contain a piece of a highlight reel. Literally. The cards themselves look like they could be some of the best of the year already, especially the ones from the previews posted around the internet. After taking in the astounding designs, I am ridiculously excited for cards like the Lustrous autographs. What can I say; I’m a sucker for cool concepts. For these cards, which are embedded with two patches, the player has hard signed a translucent surface, giving the autograph a luminescent look (almost like it is ominously floating in the middle of the card). Another favorite of Black collectors are the cards that have signed pieces of game-used jerseys. They have brought this back for football, and have included a pretty impressive checklist of players. 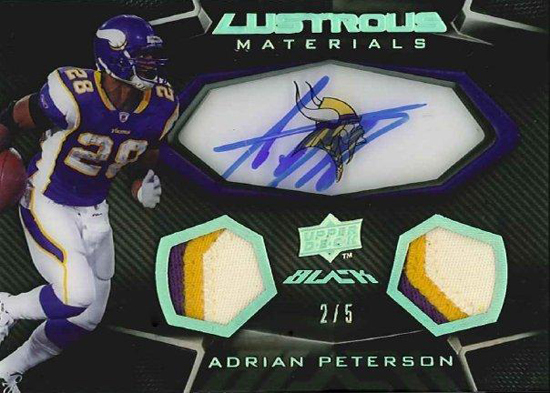 Players like Adrian Peterson and Emmitt Smith are paired together on one card, both with autographs on game-used jersey pieces in the card itself. It’s a pretty stunning look, if I do say so myself, especially because collectors are so used to seeing unsigned jumbo swatches in their cards. With these, the added connection to the player is even more evident, as you have an autograph and a jersey right there on the same piece. This is a type of card that hasn’t been done since 2005 Exquisite Football, and I am very happy to see that it is making a comeback. 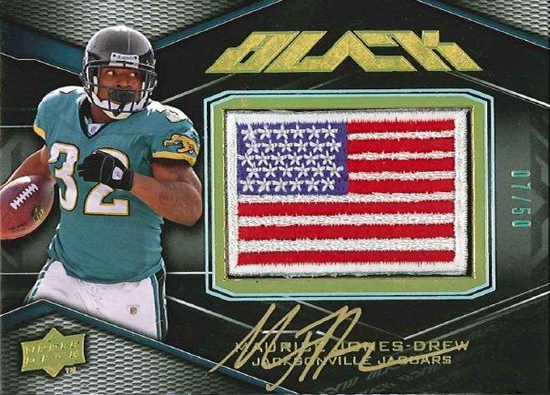 Similar to Black from previous years, the Flag cards are popping up in football as well. They include a flag patch representing the player’s home country, and will be done in signed and unsigned versions that will be included with the hits in the pack. Both versions look awesome, and should be some of the rarer cards in the set. I remember watching collectors get excited about the flag patch autos from Black before, and I am very excited to finally be able to chase my favorite football players now. Last but not least, you have the rookies: a major piece of any football set. The rookies in this set are done in true Black fashion, with more multi-signed cards than you can shake a stick at. All of them are signed on card, and all of them look amazing. This class is shaping up to be one of the best rookie classes in some time, so you can bet these cards are going to be quite valuable. They are also extremely low in their print run, making it even more important for every player collector to get their hands on a Black autographed rookie card. 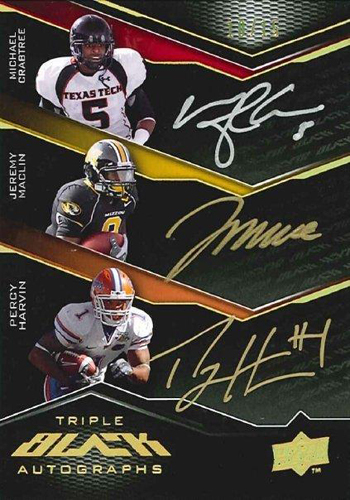 Because Black is one of the first hard-signed, high-end products of the year, collectors are going to go nuts with how great the rare autographs and memorabilia cards are going to be in this set. I will be one of those people going nuts, especially because I am finally able to have the fun that people in the other sports have had with this cool idea for a product. Also, with every card being hard signed, they are looking to be that much better than anything else available so far. I can only imagine how valuable some of the lower numbered cards will be, and I will definitely try to find a way to buy as many of them as possible. Lastly, I was surprised to find that 2009 Upper Deck Black can help solve your problems too. Check out this video that also gives a great preview of the cards. i love the look of this product!